I'd been running a Core 2 Duo as a home plex / file server + HTPC for the past 5 years and it worked fine, but I wanted to start using it for light gaming and future-proof it for the 4K era. Combined with the need for significantly more storage, I justified the need for a new system, with the following requirements: 1) 24x7 home server for file storage (mainly media), media downloading and backups, 2) Plex server for 2-3+ concurrent 1080p transcodes, 3) HTPC connected into my TV (Pioneer Kuro), 4) Light gaming at 1080p (this is not my primary gaming rig). Case - Have always loved the GD07 and GD08 for their looks, size and cooling. Ultimately chose the GD07 because of the two 5.25 bays which gives me more storage space if I need it down the track. Theoretically, if you wanted to use 2.5" drives in those bays you'd fit 21 hard drives in this machine. Plus, the locked cover helps avoid accidental shut downs at the hands of my 2-year old son. I'm using the in-built Silverstone fans which run very quiet. Overall this thing is shockingly quiet compared to my old system... the Nightjar PSU probably helps with that (more on further down). Motherboard - The P10 WS is workstation grade so figured it will help with the intended 24/7 operation. Key reason I chose the C236 chipset was for the ECC ram and Xeon support which probably isn't a must, but again, I plan for this thing to run constantly for the next 5-7+ years so reliability and stability were high priority for me. Had read mixed reviews on the board but I've had zero problems with it. Note: As others have said, I would not advise trying to fit anything bigger than an ATX board in this case despite what Silverstone advertise. The cable management is already challenging. I considered the mATX version of this board which would also be fine and help with interior space. CPU - Chose the 1230 v6 as I felt it was the best value of the Kaby Lake Xeon range and I didn’t need the Intel GPU models. Comfortably can transcode 3-4 1080p streams with Plex. As this system is also my HTPC I am direct playing content to my TV, so no need to worry about 4k transcoding if/when I eventually buy a 4K TV in the next 1-2 years. My Pioneer Kuro still looks fantastic 10 years later. The Noctua NH-U9S had great reviews as a cooler and just met the height requirement for the GD07 – another contributor to this system running very quiet. Very happy with it. 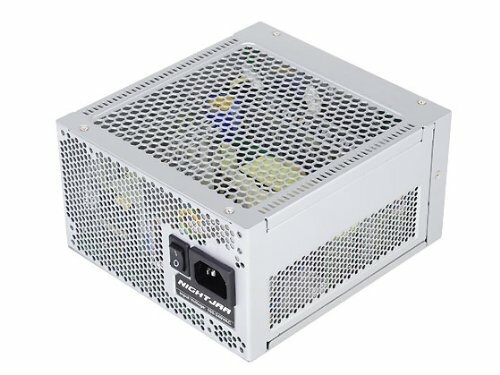 Power Supply - I've always wanted to build with the Nighjar 520W based on the fantastic reviews, having never used a fanless PSU before. I can tell you, it's awesome. So damn quiet which is a huge bonus for a HTPC sitting in my living room. Read reviews about the coil whine but that is imperceptible to me, and probably helped by the fact the case sits in a cabinet. I will have to upgrade this PSU some time down the track when I fill up all the SATA slots, but that will be a few years away at least. This thing will still comfortably power a GTX 1080 if I decide to upgrade the GPU. Storage - This Asus mobo has an M.2 slot so may as well use it, and I chose the Intel 600p. At 256GB it will be enough for Windows and a few games I want faster load times for. 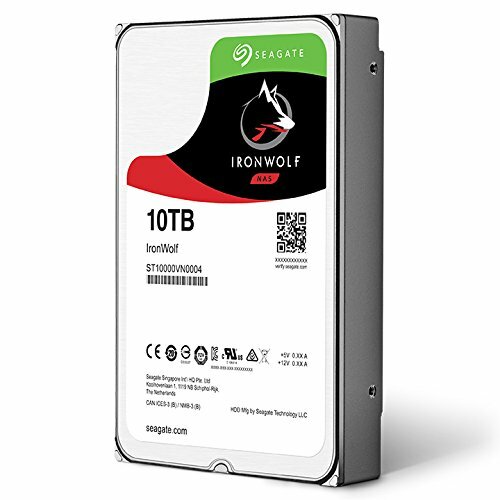 For media storage, there’s a 10TB Seagate Ironwolf and I added a couple of older 3TB and 4TB hard drives I had lying around to give me 17TB total. I’m running Stablebit Drivepool to pool the drives as I don’t really need a RAID. It’s running really well so far, and I have my most important media set to duplicate to avoid a drive failure. Love the flexibility of being able to add any drives at any time, and the fact the whole thing uses NTFS so easy plug and play into other systems if needed. I weighed up using FreeNas, RAID, unRAID and a whole bunch of other options. But because of requirements #3 and #4 on my list, I was always leaning towards a Windows system, and Stablebit Drivepool seemed the simplest and most flexible solution for me. GPU - I already had the RX460 lying around and didn’t buy it specifically for this machine. But it’s a perfect fit (literally), as the small dimensions allow me to use all the drive bays - you’ll basically need a mini-ITX sized GPU to use them all. It’s completely powered by the motherboard so minimal additional heat added, and it will handle hardware transcoding for media viewing. This GPU was previously paired with a Pentium G4400 on my wife’s machine and it performed OK (she mainly played HOTS), but I was pleasantly surprised to see how much better it performed with the Xeon on this system. Have been playing Destiny 2 at 1080p with Medium settings and comfortably hitting 60fps (I bought a Razr Turret to make couch gaming easier… was worth it). I suspect in 1-2 years I may upgrade, potentially looking at either the Zotac or Gigabyte mini 1080s. But I can definitely recommend this card (or the newer 560) for HTPC and light gaming duties. OS - Windows 10 Home. Thought about going with Windows 10 Pro but decided it wasn’t worth it as I don’t plan to use Bitlocker or join an AD Domain. Memory - The P10 WS has a decent QVL for ECC RAM (a lot more than some of the other C236 boards I looked at), and I went with the Kingston 2400MHz which is the fastest speed the board will take. After one month of use, I’m pretty happy with the build. Very stable, cool and quiet, and great performance for what I need. No heat issues sitting inside my cabinet (which had a closed door too). It ticks all of my 4 boxes and the gaming performance is actually better than expected. The cable management will become challenging as I add more drives, which is about the only complaint I have right now. I’ll probably update the build when I move to a 4K TV. For anyone with the idea of a combined plex server / nas / htpc / gaming machine, hopefully this will help with some ideas… or at least prove it’s possible! Terrific value Kaby Lake Xeon. I have this running in my HTPC / file server 24x7 and it has been very stable and cool. The gaming performance is also surprisingly good. If you're running your own GPU and don't need the integrated Intel one, this is the best pick of the range. 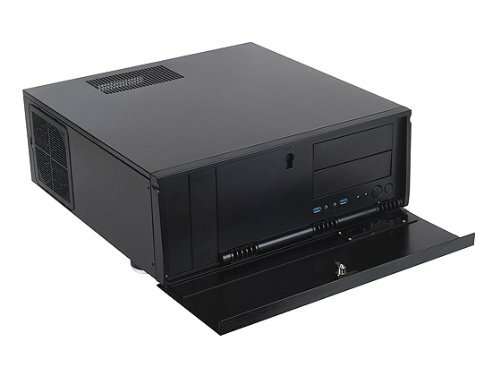 Runs beautifully quiet and relatively compact. It just fits into my Silverstone GD07, I have it paired with a Xeon E3-1230 V6. Very happy with the performance and worth the money. Chose this for the C236 chipset after a long deliberation and much research. Had read mixed reviews on the board but I've had zero problems with it. Has been running in my HTPC / file server 24x7 for the last 3 months with zero issues. Only reason I wouldn't give it 5 stars is lack of USB 3.1 and the fact that using the M2 slot means one less SATA port can be used (which could be an issue if you have massive amounts of data). Have always loved the GD07 and GD08 for their looks, size and cooling. Ultimately chose the GD07 because of the two 5.25 bays which gives me more storage space if I need it down the track. Theoretically, if you wanted to use 2.5" drives in those bays you'd fit 21 hard drives in this machine. Plus, the locked cover helps avoid accidental shut downs at the hands of my 2-year old son. I'm using the in-built Silverstone fans which run very quiet. My only criticism is that with the motherboard I chose (ASUS P10 WS ATX) it's a pretty tight fit and there is very little room for cables, especially if you have a lot of storage. Silverstone advertise this case can take bigger boards, but I honestly can't imagine how they'd fit. First time building with a fanless PSU and I can definitely say - this one lives up to the hype. I'm using it in my HTPC / file server which sits in the lounge room so quiet operation was important for me. Definitely glad I spent a bit extra on the Nightjar for this reason. Thanks for sharing! I am planning an upgrade to Ryzen/DDR4 in the next 6 months for our main pc, and then re-purpose the current set up to a similar purpose to what you have. I plan on using Ubuntu Server and the only function other than server/plex I am planning is use of various utilities for media creation/management, so no need for gaming hardware. Was your previous system running ECC memory? Any thoughts on the subject? First time running ECC. My only thoughts are what I've gathered from online research, that being it's more reliable with lower failure rates, but you only tend to reap these rewards from systems running under load for long periods of time. Downside is that it won't come in higher ram speeds and that its more expensive, but for my purposes 2400mhz is more than enough and the cost wasn't prohibitive. Thanks! Yep, these are considered entry-level Xeons and are pretty good value for money even for normal home/desktop use. They are pretty similar. The 7700k is clocked higher, but the Xeon uses much less power (72W vs 91W). Depends on the use. For a pure gaming system I'd go the 7700k especially if you want to OC, but for a home server the Xeon makes more sense. The C236 chipset is mainly for workstation / server builds but can run any 1151 CPU. It's very much a standard chipset, just less common. Yeah, I'd never seen a chipset like that before. 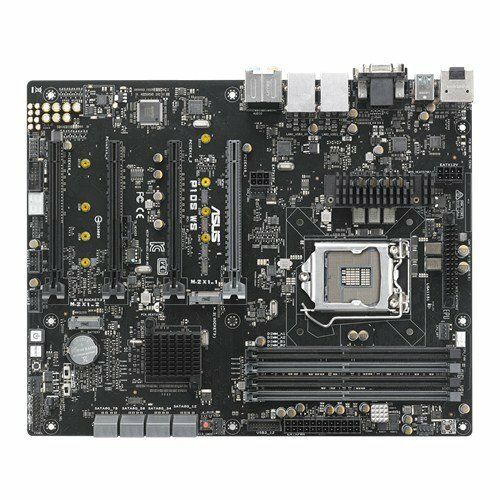 One question: How many M.2 slots are on this motherboard? According to Asus, they mention a pair, and highlight that installing an M.2 SSD (SATA or NVMe) will disable a grey SATA motherboard connector. Could you confirm, based on your build? There are indeed 2 and use of either will disable a corresponding SATA connector. So if you used both M.2 slots you could only add 6 SATA drives. This is a bit of a trade off if you’re building something to store a lot of data (which I am) so I’m left with capacity for 7 big drives. But I suppose you could always add a RAID card for more down the track.